POSTED BY kavitapaliwal ON 28-Nov-2018. With so much of advancement going around, ways of promoting business have also changed. Nowadays, promotions through social media platforms are becoming popular for all the right reasons. Out of these, Instagram has constantly proven to be a humongous social media platform for business promotions. Instagram has consistently improved the experience of business profile users. It is used by millions of users making it one of the best place for any business promotions. But, not every brand promotion gets successful. The main reason behind this is not using the right way. 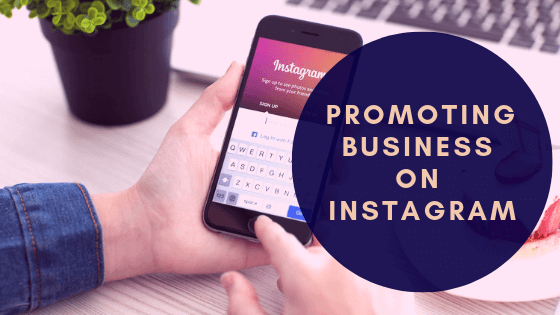 In this article, I will help you to know about some effective ways in which you can promote your business on Instagram. The first and the foremost thing to do is to create a business profile. Before creating an Instagram business account, you need to first create a page on Facebook for your local place or business along with a standard Instagram profile. Once you are done creating these, you will start receiving an option of switching to a business profile. Instagram reflects this option under the setting option. Try to operate your Facebook and Instagram handle from the same handle to avoid confusion among your customers while searching for your business. Always keep your business profile about your brand. It should only be a reflection of your business. Since all of us know that Instagram is a fun and casual place, it is best recommended to keep your personal and professional appearance different. Where your personal account can be used for uploading your selfies, vacation photos or other personal posts, a professional account, on the other hand, will be all about your products and business that you are promoting. Many new business profiles are made every day but only a few of them is able to make their customers attract to them. This happens only when a high-quality post is uploaded on it. By high-quality content, we mean visually attractive and relatable content that people find worth following. You can easily create some engaging and exciting posts by using tools like Canva. This tool is very pocket-friendly and time-saving for creating Instagram stories. You can easily choose a template and start working on it. Not to forget, captions also play a major role. Captions that you use must be in sink with the image that you are uploading. Use relevant hashtags so that it becomes searchable and discoverable by other users as well. Uploading various unique and colorful videos like boomerang and others of our happy customers also looks appealing. Customers will automatically find a sales content as a turn off from your business so never ever make your content look pushy. Instagram allows only one line for a website on a profile. It has a limit of 150 characters on a bio so bring it to best use. Your bio should only include relevant and catchy lines about your business. Remember to keep it understandable and attractive to your customers. People get more excited to follow any business page that has high-quality content in it. Your bio should also depict the business objective clearly in it. This year Instagram has yet again wowed its users by adding the feature to shop on Instagram itself. If you are amongst those who produce physical goods in selected categories then you will be able to enjoy this update. This new feature includes a few steps and you are good to go. If done correctly this can insanely increase your customer conversion rate. I hope all the above points helped you to come across some ways in which you can promote your business using Instagram. In case of any doubt feel free to contact us through comments below. Thank you!